What is the Best Way to Leverage an Article? 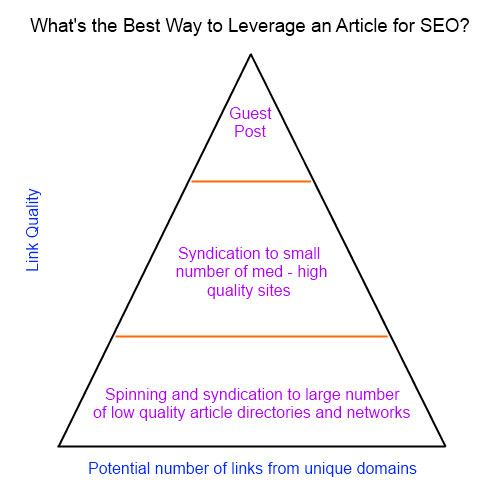 This post seeks to explore which use is the most effective way to leverage an article for maximum benefit. The traditional use would be to post the article straight onto your main website where it can rank in the search engines and attract visitors for years to come. 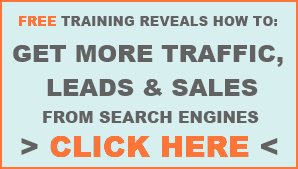 The article can also be shared on social media and linked to from elsewhere to give your website traffic and an SEO boost to lead to better rankings overall. However, there is no guarantee that you will get links, unlike the other article uses mentioned. Earning links simply by writing good quality content is getting harder and harder so perhaps leveraging your article to obtain value exchange links is a better use of your content. These are links that are gained by giving something of value in exchange for a link back to your website. Money is a common form of value that is exchanged for links but in this case, the 'value' is the right to use a piece of content on a website. The three uses in the diagram above are value exchange links where you grant another website owner the right to use your content on their website in exchange for a link pointing back to your website. These techniques produce guaranteed links which reduces risk and increases the efficiency of your SEO efforts. The lower quality method at the bottom of the pyramid has the potential to deliver tens - hundreds of links from low-medium quality websites. The links are likely to have a lower life time value so this technique has less long term value but the sheer number of links, with desired anchor text can still have a good effect on your rankings in the short term. The higher quality techniques will produce much fewer links but they will have a greater long term value, greater authority and link value and have other benefits such as increasing your reputation and gaining exposure from a relevant audience. For more information about the SEO value of 'value exchange links' see my recent post discussing whether article syndication is white hat.